But the political background of a former Gorsuch law student who defended the SCOTUS nominee was not provided. CNN quoted former Gorsuch law student, Catherine Holtgrewe, as saying Gorsuch never spoke “disrespectfully to or about anyone” — without identifying Holtgewe as a former Romney staffer and the volunteer coordinator of the failed 2006 gubernatorial campaign of Bob Beauprez. She works for a conservative think tank. CNN quoted a letter, first reported by NPR, that Sisk wrote to the Senate Judiciary Committee, claiming that Gorsuch told her class that “companies must ask females about their family and pregnancy plans to protect the company,” CNN reported. Sisk writes that she was “distressed by the tenor of his comments” and made her concerns known to the law school’s administration. Sisk, a registered Democrat who once worked for former Democratic Sen. Mark Udall of Colorado, confirmed to CNN that she authored the letter. Obviously, Holtgrewe’s political background is relevant to the story, as is Sisk’s. CNN need not have included Sisk’s political party. I did not immediately receive a response to a tweet to Ashley Killough, a CNN political producer, whose byline appeared on the piece. 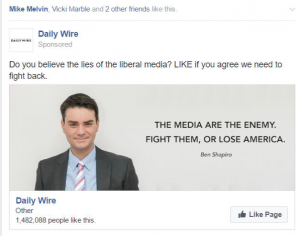 If we’re going to fight fake news together, as conservatives and progressives, we have to agree on 1) a definition of fake news and on 2) a set of arbiters that will determine if a news story is fake. In a post last week, Ari Armstrong argues that any news outlet can produce fake news, even the New York Times. I’d rather say outlets like the New York Times never produces fake news, because when they do it’s by accident, but I gave up on that a while ago and now agree with Armstrong that the definition of “fake news” should focus specifically on the accuracy of a news article, not its source. This definition should be acceptable to both conservatives, who are skeptical of the New York Times, and progressives, who see look askance at Fox News. But the sticking point is arbiters. Can conservatives and progressives agree on a way to decide what’s fake news and what isn’t? Again, the Fake News Pledge offers a compromise. Notice the phrase “respected news outlet” is not defined, so there’s space for progressives and conservatives to rely on different arbiters of truth. And there’s room to reject any arbiter simply by providing an explanation. What good would this do? Signing the pledge shows a shared commitment to a set of loose ground rules for rational discourse, which is especially needed now on Facebook. The pledge is a statement that facts matter and that people, especially our elected leaders, who toss out dubious facts at least have the obligation to explain why they they think their facts are true. 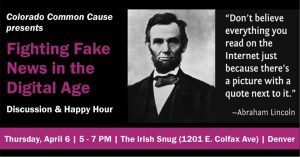 Under the slightly edited guidelines of the Fake News Pledge, Facebook users can post or share unproven information on Facebook, if they do not claim that such unproven information is true. This does not mean that posting unproven news items is encouraged by the Fake News Pledge. On the contrary, some, but not all, unproven news can poison rational discourse in much the same way falsehoods do. But the purview of the Fake News Pledge covers accuracy only. For example, U.S. Rep. Mike Coffman (R-Aurora) recently called for an investigation into FBI leaks. And U.S. Rep. Jared Polis (D-Boulder) called for in investigation into Trump’s actions in Russia. Both of these news items are unproven but neither is presented as true. Therefore neither would be considered fake news, under the new guidelines of the Fake News Pledge. On the other hand, Donald Trump’s statement that millions of illegal ballots were cast against him in the 2016 is unproven and false, under the guidelines of the Fake News Pledge. The change was made after critics pointed out that unproven allegations, from trustworthy sources, have a place in civic discourse, as long as they not presented as true. It’s not the role of the Fake News Pledge to define the criteria that make unproven news, not presented as true, credible enough to spread on Facebook. 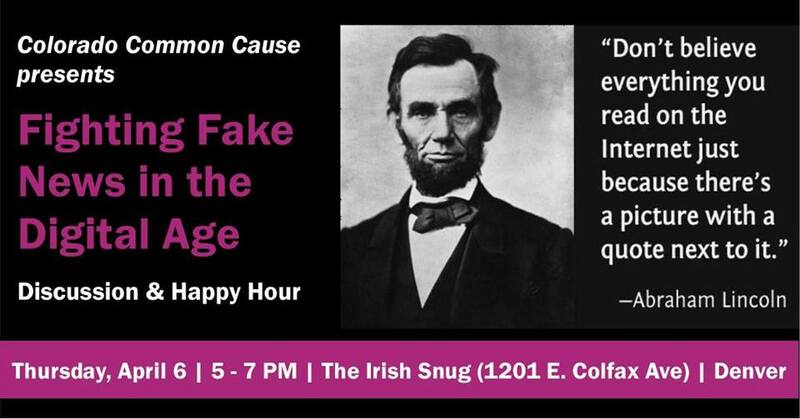 With respect to accuracy, which is now the sole purview of the pledge, the Fake News Pledge states that information, packaged somehow to look like news, should not be spread on Facebook if it’s “deemed unproven or false or inaccurate by Snopes, Politifact, Factcheck.org, or by a respected news outlet.” If such information is posted, it will be removed unless “detailed reasons for not deleting it” are provided. 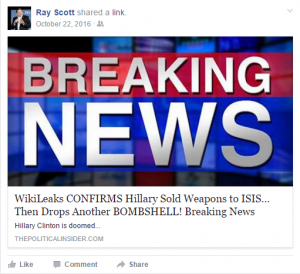 State Sen. Ray Scott (R-Grand Junction) calls the Grand Junction Sentinel “fake news“–until he finds a Sentinel story he likes. Then the fakeness is conveniently forgotten. “Denver water attorneys against farmers,” wrote Scott on Facebook last week, referring to a Sentinel article by Charles Ashby about a bill stalled in the state legislature. “This isn’t fake!” wrote Scott on Facebook. Scott’s hypocrisy is so brazen yo u honestly wonder how he could possibly justify trotting it out on Facebook. But as I’ve noted before, prior to his fake-news outburst last month about the Sentinel, Scott regularly posted Sentinel articles on Facebook–when he agreed with the reporting or found it useful. And the truly sad part of all this: Scott still has actual fake news posted on his Facebook page! I doubt you’re surprised, but still. He’s not responded to numerous emails and phone calls from me asking that he remove it, like other lawmakers have. 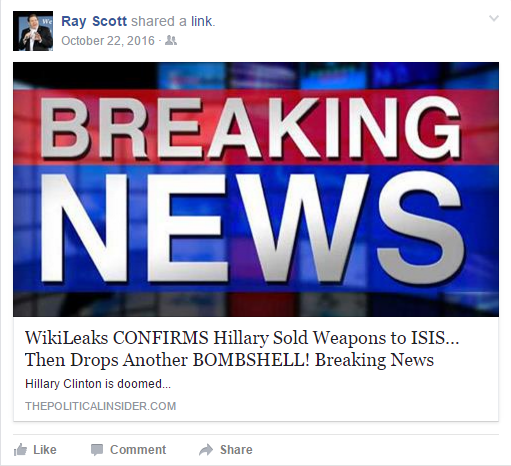 Maybe Scott thinks his fake news, which informs us that “Hillary sold weapons to ISIS,” is real? I don’t think he even believes it, to be honest. But you’d think he’d remove it from Facebook, just to take the spotlight off his own ridiculous double standard. During his conference call with constituents last week, U.S. Sen. Cory Gardner (R-CO) boasted about being bipartisan when, in fact, he was just being a manipulative partisan Republican. Asked why he’s voted with Trump 100 percent of the time, Gardner told constituents on the call that most of his Trump votes were for cabinet posts, and Gardner believes any president should be allowed to select his own team, unless extreme circumstances dictate otherwise. “I think it’s important that the president have the people around him that the president nominates,” said Gardner on the phone call. Gardner then patted himself on the back, and made himself look all bipartisan, by saying he “voted to end debate” on whether Obama’s nominee for attorney general, Loretta Lynch, was fit to serve. But instead of a pat on the back, Gardner deserves a spanking for talking out of both sides of his mouth, because after he voted to end debate on the Lynch nomination, he actually voted to reject Lynch. Thumping his chest in 2015 at right wingers who were apparently applying the “heavy lobbying,” Gardner even shot off a news release after his vote against Lynch. Unless they happened to possess crazy knowledge of U.S. Senate rules and Gardner’s votes, folks on Gardner’s conference call last week may have thought Gardner really believes a president should be able to select his cabinet members when, in fact, he seems to believe this for Trump but not Obama. Gardner’s intent was clearly to manipulate his constituents, and reporters should call him out on this tactic. You are currently browsing the The Big Media Blog weblog archives for March, 2017.